Too many times I've procrastinated buying something I really liked only to have it sell out. I debated the sparkly situation by Asos, above, (too much? too gold? ), but then ultimately pressed the purchase button as it cost under $300 (and is returnable). It was a huge success at a holiday party this weekend--and it's now--yay me!--sold out. 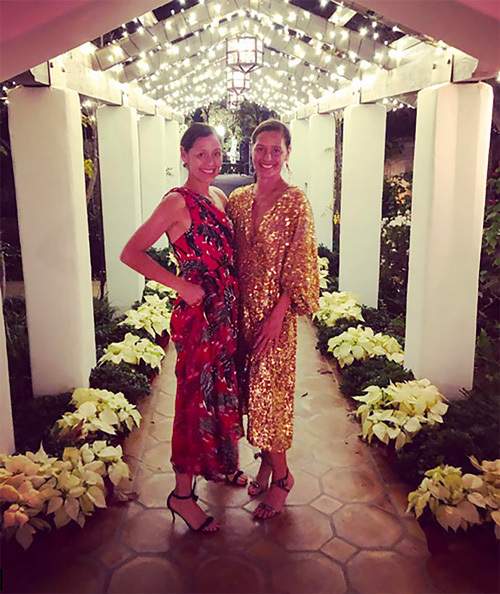 This prompts me to once again re-consider other options I've been debating lately such as this floral Topshop dress (I first spotted it on a NYC-based fashion publicist), these Anne Sisteron huggies (I love how it looks like two studs! ), this vaca-ready Acler mini, and this Amur one-shoulder knockout. My sister is wearing a gorgeous Carolina Herrera dress that she pinched from my closet. It can be found here (on sale! ).